Formed in 2010 by husband and wife team Annie Tierney (Chicks, The Radio, sister of Mik Pyro from Republic of Loose) and Padraig O’ Reilly (Yeh Deadlies), and later joined by Ruan and Ian from Squarehead and assorted other Popical pals, Tieranniesaur have fast become “one of the country’s most well-loved new bands” - Harmless Noise. upon its release in July 2011 and topped many critics’ and readers’ end of year poles. More recently it was named as one of the Best Irish Albums of State Magazine’s lifetime. 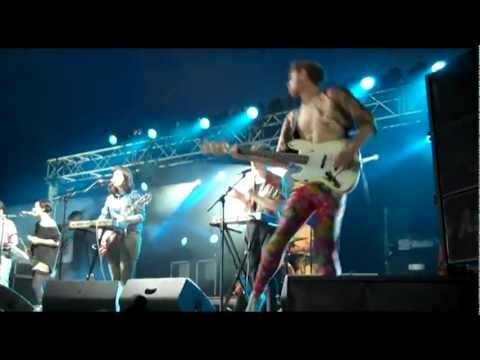 “The best sets at Electric Picnic” - Golden Plec) and were lucky enough to play alongside their heroes Tom-Tom Club and Chic. 2012 also saw the band set sail to the UK, where the NME enthused that they were “currently crushing on the ace Tieranniesaur”. There music has been used on TV shows such as RAW, and singles have received regular radio play. Tieranniesaur is a genre straddling troupe that’s part old-school Euro Disco, part Afro-Pop and part Riot Grrl vitriol, an infectious mix of sincerity and Hip-Pop swagger. First single Sketch! featured in Nialler9’s “Best songs of 2010” and the subsequent single Here Be Monsters garnered plaudits and regular radio play up to the present moment. "Funky like a New York City block party... one of the best Irish acts doing the pop thing at the moment." - Jim Carroll, Irish Times.